So, this is a card for Wednesday's SCS sketch challenge. The stamp set is Unity's Shine On. The DP is Stampin Up which I found out I have NO card stock to match so I had to improvise. 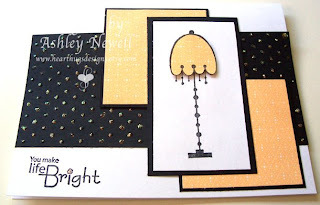 The black card stock was run through the Cuttlebug with the Swiss Dots folder, then I used Diamond Stickles to highlight each dot which is something I learned from the amazing Lee Murphy. Happy Friday Friends and I hope you have a good weekend! I really love this! Are you standing on your head enough?! Hang in there dear! Love this card!! !My thoughts are with you!! I love it. I'll have to remember the stickles on the dots thing. Come out, come out Parker! love your card...even with the stickles! :) Hang in there!! This is just one stunning card. Love this sketch and the colors are beautiful together. I love this stamp set too. Sorry to hear you are still waiting, but each day, hour, minutes, and seconds you are getting closer. Great card! Hang in there Ash! Almost over and it will be worth all the discomfort and agony! I love the yellow & black combo here! I'll be thinking of you. Very nice card, lady!!! tfs!! Fabulous idea! I hadn't learned that one yet, but I love it. We need to send Parker an eviction notice. Cute!! I had to check your blog today to see if you posted since I couldn't chat last night. Waiting is the worst - but it will be worth it when the baby gets here! Hugs!! gorgeous card. my thoughts are with you as are my prayers. just checking in to see if you had your baby. it'll be this weekend, for sure! Seriously I love this!!! I love the white black and yellow together!!! This is my new favorite of yours right now!!! You are being so patient and so great girl I am very very very proud of you!!! Being a Labor and Delivery RN I see so many pregnant women start begging to be induced at like 37 weeks and it is so much better to wait and go on your own when the baby is ready and I am so super proud of you for hanging in there!!! Hope you are having that baby right NOW!